In Allison Slotnick’s “Friend the Present”, she connects politics and social media to each other, claiming that they are essentially the same. She continues, “It seems so simple once it is boiled down: both politics and Facebook are essentially dependent upon strong and persistent networking” (p. 254). As President Barack Obama’s 20008 Campaign demonstrates, social media can be an integral part of politics. Many people proclaim that the usage of online advocacy is a major reason for his landslide victory. As Monte Lutz further describes, Barack Obama and his skillful campaign staff were victorious because they were successful in “converting everyday people into engaged and empowered volunteers, donors and advocates through social networks, e-mail advocacy, text messaging and online video.” While President Obama was not the first to use the Internet as a part of his campaign, he was the first person to do so correctly. Obama was able to not only raise money and create an online community, but he was able to turn his online support into physical votes. Which truly emphasizes that campaigns as we formally knew it are no longer status quo, instead, they are being replaced by the wide-ranged capabilities of the Internet. By looking at the millions of people Barack Obama was able to reach out to by using contemporary campaign practices such as E-mail, Social Networks, and his website “Mybo.com,” future advocates and campaigners would be foolish not to use similar methods. 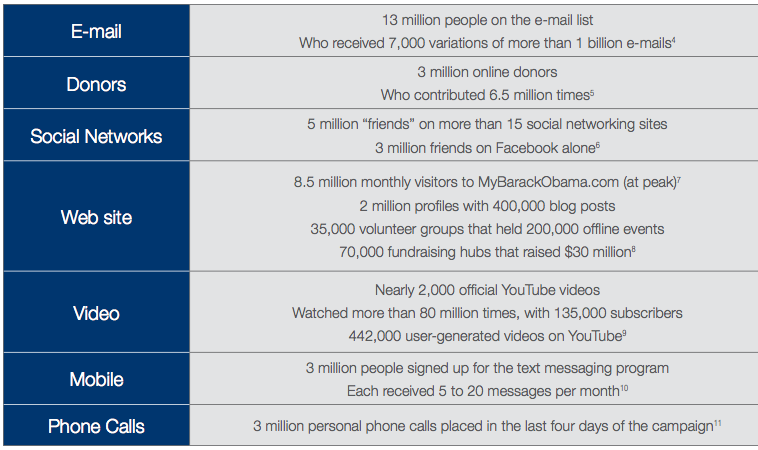 Barack Obama’s outreach by the numbers highlights the importance of using the right social media and the Internet to engage with prospective voters and supporters. Moreover, Like Lutz mentions, Obama was not on every single social media source and every website. Instead, he and his campaign staff selected the best and most popular ones. Unlike President Obama, John Edwards did not do this, but instead ineffectively chose to cover every inch of social media websites out there. He was unable to reach as many people and create a lasting impact. Looking at the success of Barack Obama’s 2008 Presidential Campaign, do you think that the campaign process will continue to evolve in a way that eventually wipes out traditional (and arguably more grass root) styles such as door-to-door campaigning, distributing pamphlets, etc? I think that the Internet is becoming the most powerful resource for candidates, but will never be the sole resource. The ability to connect with people face to face is an element that the World Wide Web will never fully be able to replicate. While the Internet may wipe out paper resources (e.g. pamphlets, newspaper ads, etc. ), it fundamentally cannot replace direct human contact. Additionally, the importance of staying local (often accomplished with grassroot campaign strategy) is now enhanced by the Internet and figures to remain a critical part of campaigning in the new media environment.